This Man Booker Prize–winning novel is now a major motion picture. A novel so compelling that it begs to be read in a single setting, The Sense of an Ending has the psychological and emotional depth and sophistication of Henry James at his best, and is a stunning achievement in Julian Barnes's oeuvre. This intense novel follows Tony Webster, a middle-aged man, as he contends with a past he never thought much about—until his closest childhood friends return with a vengeance: one of them from the grave, another maddeningly present. Tony thought he left this all behind as he built a life for himself, and his career has provided him with a secure retirement and an amicable relationship with his ex-wife and daughter, who now has a family of her own. But when he is presented with a mysterious legacy, he is forced to revise his estimation of his own nature and place in the world. 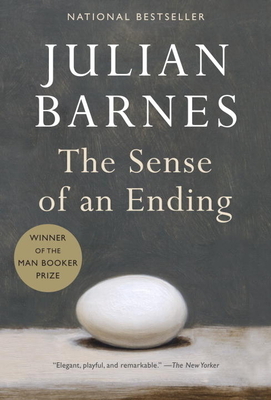 Julian Barnes is the author of twenty previous books including, most recently, Keeping an Eye Open. He has received the Man Booker Prize, the Somerset Maugham Award, the Geoffrey Faber Memorial Prize, the David Cohen Prize for Literature and the E. M. Forster Award from the American Academy of Arts and Letters; in France, the Prix Médicis and the Prix Femina; and in Austria, the State Prize for European Literature. In 2004 he was named Commandeur de l’Ordre des Arts et des Lettres by the French Ministry of Culture. His work has been translated into more than forty languages. He lives in London. "Brief, beautiful. . . . That fundamentally chilling question—Am I the person I think I am?—turns out to be a surprisingly suspenseful one. . . . As Barnes so elegantly and poignantly reveals, we are all unreliable narrators, redeemed not by the accuracy of our memories but by our willingness to question them." —The Boston Globe.